We are delighted to announce that for a limited period, we are able to offer 45% off on Selected Ranges when you book a no-obligation survey before Midnight of April 14th 2019 with fitting completed by May 31st 2019. ONLY A FEW FITTING DATES AVAILABLE – FIRST COME FIRST SERVED. 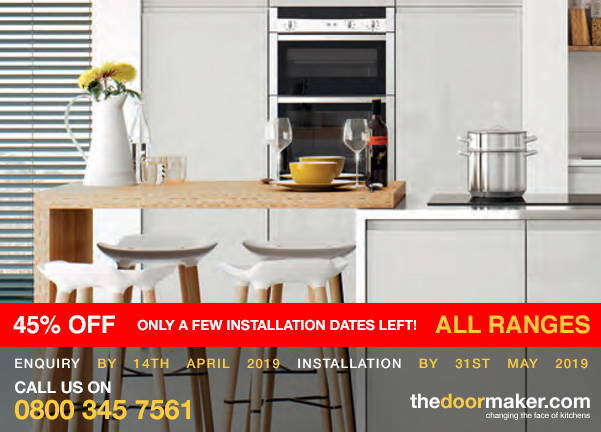 Order your free no-obligation kitchen survey by midnight of 14th April 2019 and you will qualify for 45% off on Selected Ranges with installation on May 31st 2019. This genuine promotion may be withdrawn at any time – and applies for a very limited period. This offer is available to first time callers only.